Very pretty set, comforter is nice and soft. I love the colors. Very beachy. The fact that it came with a bed skirt was very important. Vert comfortable. The Madison Park Essentials Barret Complete Bed and Sheet Set provides a casual and modern update to your bedroom. A printed watercolor stripe motif, in aqua, grey, and white hues, is beautifully displayed on the ultra-soft microfiber comforter. The coordinating sham(s) complements the pattern seen on top of the bed to pull the ensemble together. A 100-percent cotton sheet set includes a fitted sheet, a flat sheet, and the pillowcase(s) in a textured grey hue to complement the casual style of the comforter. Beautiful but the sheets are garbage. Can’t use them as it’s like sleeping on sand paper. Trying baking soda and vinegar now to see if it will soften them. The colors are just as pictured. Have not washed yet, so I don't know how it will hold up, but the quality seems good for the price. Pretty comforter but bunches up when you wash it! Colors are nice and material washes well but stuffing in it bunches when washed! Washed in a gentle cycle but still bunches up! Color and design are beautiful, however the quality is very poor. The fabric on the sheet set is extremely cheap and the fabric is so rough that I am unable to use them. The construction of the comforter is also disappointing as the stitching on the top is uneven in length and location. Doesn't seem to be a rhyme or reason to the way it is assembled. I am only keeping this set because I designed a whole room around the colors of the comforter. Now this comforter is just gorgeous! It looks nicely with the new chrome bed we ordered also. Just the right thickness, not at all to thick but thick enough to do the trick during the winter months coming up. Beautiful colors and I have grey sheets so it looks so nice together. Nice quality and hangs so smoothly on the bed and over the side of the bed. Love the quality of this! 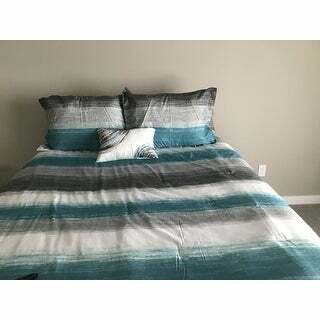 Great quality comforter and sheet set. The shams are a soft cotton, unlike most that are merely decorative. Reasonably priced for the product. I bought this for my sons room and I really like it. The material is not heavy and easy to wash. The sheets fits perfectly in a foam mattress so I just don't know how it will fit in a pillow top mattress. Very nice, complete set! Big bang for the buck: small decor pillow, sheets and pillowcases, comforter and matching pillow covers. Beautiful colors, exactly as advertised. The set looks beautiful in the room. Really enjoy this set. The colors are perfect for what I was looking for. I would gladly recommend to others. Great price great product quick shipping. I already tell others to check with Overstock for what they are looking for. Love the color and very good quality. Love the color and the feel of this set!! Beautiful, exactly as picture, quite a value. Really fits perfectly and would highly recommend this set to anyone. It is both masculine and feminine and goes with the other items I ordered from overstock, coordinating beautifully. Not high quality. Ok for maybe kids room. Really pretty set! Comforter is very soft! "Are pillows included ? If not where can I buy them ?" This information is not available. We apologize for nay inconvenience we might have caused. one decorative pillow is included. you will need to buy the pillows for the shams. Yes,this is made of microfiber polyester. "i'm wondering if the comforter is slippery on the bed or if it stays on during the night? thanks"
the comforter does not slip off...it stays on quite well. "Are the sheets soft or scratchy?" "I have a cal king bed. The difference between a cal king and king are: Cal kings are wider and shorter; kings are narrower and longer. Either the measurements shown are wrong, or you need to switch measurements for the appropriate “names” of each listed king size. This is important for the sheet sizes. I want to order a set; please help."